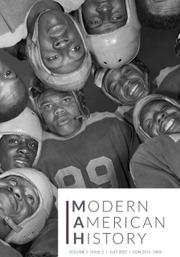 Modern American History (MAH) showcases top-quality, emerging research on the history of the United States since the 1890s. Aiming to stimulate debate and make meaningful connections between the subfields of this vibrant and expansive field, the journal publishes compelling peer-reviewed articles as well as substantial review essays, forums, and other special features. Devoted to thinking about books, this essay (2,000 words) goes beyond the basic book review in order to address key historiographical trends and questions. A provocative think piece that makes a clear intervention or otherwise articulates an original vision for the field of modern American history.